The Woodworking shows are over for this year and both Lenora and I want to thank all our friends that attended the shows and supported us throughout this winter. It was great to see all the friendly faces again in all the cities that we visited. The schedule for 2019 is currently being worked on and will be released shortly, so we expect to see all of you again next year! More thoughts from the 2017 Grand Central Holiday Fair. The best sellers in dollar volume were my Cigar Label©, Watch Part©, Beetlewing & Sea Shell pens. .50 caliber pens were a hot item selling 48 pens which was a surprise for NYC. At the low end, we had Slimline pens made from colorgrain & rosewood selling over 80 pens. These items kept us busy. The Slimline pens sold for $45 each with a box. I found that people wanted these in a box rather than a pouch because most of these were going to be given as gifts. These pens did sell well however, next year we will have other items at a slightly lower price point so we can capture the “secret Santa” market. 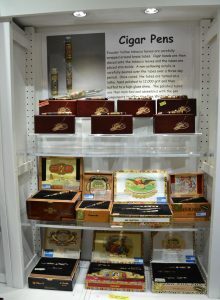 My Cigar label pens ranged from $175 to $695 depending how they were packaged with an engraved pen “cigar box” or a matching custom cigar box and label. The watch part pens ranged from $250 to $1,400 depending on the watch dial and how many watch parts were actually placed on the pen and if the nib was an 18kt gold nib. The Sea Shell pens are hard to turn because of all the seashells in the acrylic so they sold for $325 each as a rollerball or a fountain pen. The Beetlewing pens sold from $275 for a ballpoint to $695 as a FP or RB. All of my more expensive pens came with a box, and was sold as a package. It made a big difference having matching boxes for the pens, most people commented on how nice it was to have a matching box for a pen to give as a gift, or keep for themselves! 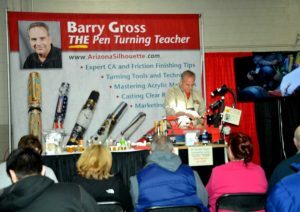 The Homestretch at the Grand Central Holiday Show! Final Thoughts about the NYC Grand Central Holiday Show – Part 1 Grand Central Holiday Show Update – Day 17 Greetings From the Grand Central Holiday Show In NYC!